The reveal and conceal pieces are the lace-filled numbers we wear while brunching. The peek-a-boos that get approves from friends and lovers alike, and the sheer-a-little frocks making you the voguish fox! I don’t usually share magazine editorials on my page, but this spread from Vogue Brazil, in which Rihanna models more jewelry than clothes, just shows that gold bangles are the timeless favorites by the cool girls’ crew. Sculpted crop tops are forgiving for so many body types. The glimpse of skin while wearing such a structured style that is sophisticated and chic. An added bonus to my fashion comrades who goes through the water works in all the wrong areas during the hot summer days, some midriff breeze relief. Click over the each item to view it’s shopping information. 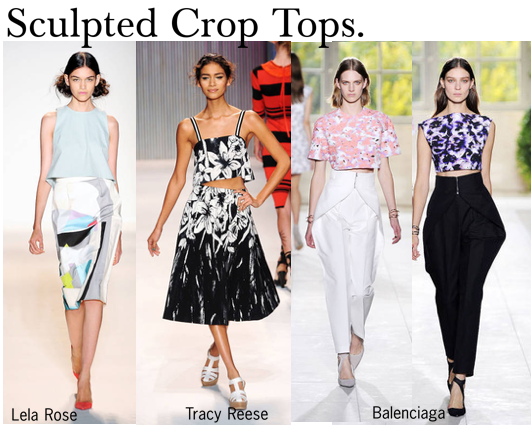 Style Tip: Wear these crop tops with high-waisted skirts or trousers. 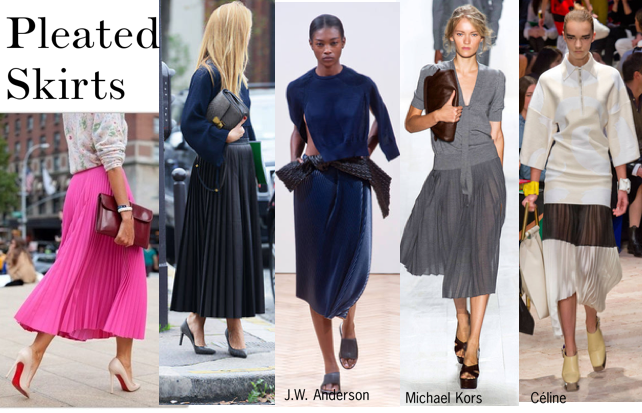 Maxi, midi, knee-length and mini; various skirt styles that can use doses of pleats, taking the schoolgirl look to fashionable modern heights. I do suggest lightweight fabrics like chiffon, silks, cotton or muslin, and getting a skirt with a defined waistband or belt friendly. 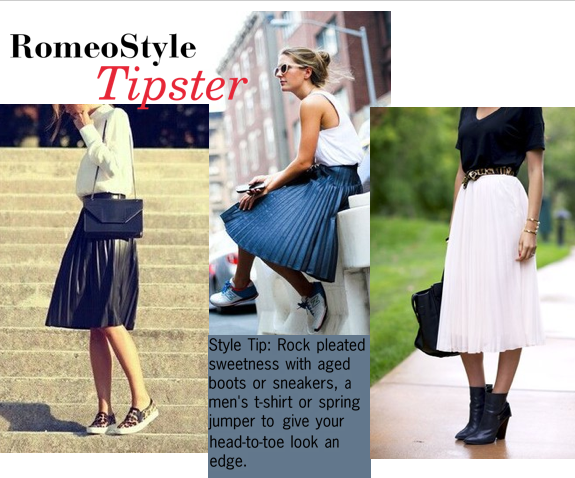 Style Tip: Rock your pleated sweetness with boots or sneakers, men t-shirts or spring jumper to give it an edge. This winter has taken a toll on the best of us. While the frigid temperatures lingers mentally, I’ve started to prepare myself for the brighter things spring and summer will offer. Staying in this present state-of-mind of layering for warmth first, looking chic second, isn’t going to sustain us. Yes ladies, all for one and one for all while I start plotting and planning ahead about the vibrant, bright outfit inspirations, must-have shopping guides and lists containing the finer things of spring/summer fashion we’ll want to wear. Getting ahead and acquiring the fashionable pieces that will make us giddy is how we should spend the rest of this brutal winter. If writing this while enduring yet another snow storm isn’t motivation enough to look on to sunnier, hotter days ahead, I don’t know what is. Wait, I was just imagining heeled sandals on my feet instead the current footwear – Aigle waterproof riding boots – I’ve worn everyday. Let’s get started on the things we’ll need for the various fantasies of spring we have going on in our heads.